Laos has to be one of, if not, the most relaxed country in the world. We were there for the end of Buddhist Lent and I don’t think it is a coincidence that this Buddhist culture is the reason the people are so friendly, helpful, polite and chilled out! As for following a low FODMAP diet in Laos? The simple answer is you can just about but you would missing out on some amazing food especially if you have a sweet tooth. Due to the French influence you cannot walk 10 meters without seeing a crepe stall or a baguette stall or a café with fantastic pastries and cakes. Also all these foods were so cheap and when you are travelling for a year you have to watch your budget everyday. In addition a lot of the noodle dishes were wheat rather than rice noodles. Therefore while we were in Laos we followed a modified low FODMAP diet the whole time. You can read more about what a modified low FODMAP diet is here. For example we indulged on crepes but with banana and chocolate fillings. Enjoyed a baguette but with low FODMAP fillings such as omelette or meats with salad (removing the ridiculous amount of onion) and bean sprouts alongside mayonnaise and chilli sauce. Mostly the ingredients in the noodle soups were low FODMAP and you could find some rice noodles. We avoided the pastries though as we were eating other wheat based foods. Plus some of the Laos coffee is extremely good and very strong! We recommend Joma Bakery in Vientiane and the Joma by the Mekong River in Luang Prabang. The Laos coffee here is fair trade too so we didn’t mind paying a premium for it. Laos has great street food and the bonus about this is you can watch them as they cook your food. Don’t want onion or garlic in your chicken fried rice? Fine just tell the street food vendor before they add it! You can get several low FODMAP vegetable options from the night food market. Just pick up a bowl and pay the vendor 15000 KIP (£1.20) and fill that bowl full of as many low FODMAP things as you can find then go back for more! I recommend the whole chicken breast for 10000 KIP (£0.80) so tasty. On your way out of the night food market you will see two ladies cooking these small rice and coconut cakes. they are called Khao nom kok. You get 5 for 5000 KIP (£0.40) and they taste like a rice pudding. See some better pictures and a video of how to make these amazing cakes here. For snacks you can find home made (giant) rice cakes either plain or covered in chocolate. In Vang Vien we got 3 for 8000 KIP (£0.64). Mok Pa is fish wrapped in banana leaf and steamed. Typically the flavours used when steaming inside the banana leaf include chilli, lemongrass, salt, kaffir lime leaf, bunch of dill (they love dill in Laos it is in several dishes and curry’s), basil, fish sauce. Garlic was also probably used in the dish we had but we couldn’t taste it. Chicken citronella is basically marinated minced chicken wrapped with lemongrass. If you are in Vientiane you must go to Ampaphone restaurant to get both of the dishes above. Also in Vientiane is a Vietnamese restaurant called Vieng Sawan where you make your own fresh rolls (nem nuong) with pork, vegetables, herbs and sauces. You can just use the lettuce as a wrap and not bother with the rice paper. Each of the ingredients are provided separately and it was funny to us to see nearly everyone leaving the massive chunks or raw garlic in its bowl! If you ever do go to Laos try to combine it with Buddhist Lent. We didn’t plan it that way it just happened to be that festival when we were there and the atmosphere on the streets was great. Everyone makes a colourful boat to parade through the streets at night before being floated along the Mekong River and set alight. Want more information on the low FODMAP diet and IBS? Click here for the latest changes and important updates. We are currently travelling around the world and plan to bring you‘Around The World In 80 Low FODMAP Dishes’ – a collection of the best low FODMAP foods and recipes as we travel the globe. See more on our low FODMAP diet travel section. Good news! The first ever book dedicated to reintroducing FODMAPs is now available to purchase on Amazon Kindle. The book is titled ‘Re-challenging and Reintroducing FODMAPs – A self-help guide to the entire reintroduction phase of the low FODMAP diet’. Click on the logo for more details. 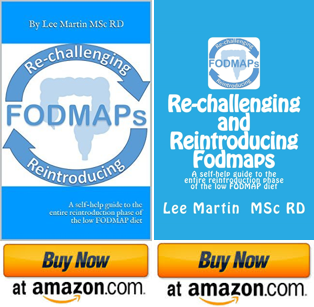 More information on Reintroducing FODMAPs here.